Experimental animation is not an area that many animation festivals forefront, let alone devote themselves to. Eyeworks Festival of Experimental Animation is a rare thing in many ways, it is defiantly small, programmed with care and imagination, and promoted with attractive, dynamic and original design. What immediately stands out is the level of attention given to every aspect, and the fact that it is the work of so few people – two in fact, plus some generous friends, a hired projectionist, and on last year’s event, an official assistant. It makes sense then that festival directors Lilli Carré and Alexander Stewart view Eyeworks as an extension of their own (considerably impressive) art practices. The result of their labours adds up to much more than the sum of its parts. It is something quite special, a world away from the corporate market places of some of the bigger festivals, and from the vanity projects of some of the smaller ones. Eyeworks comes out of an honest love of animation, and a fascination with its potential as an art form. The festival was founded by in 2010 and runs yearly in Chicago, with additional screenings elsewhere throughout the year. Showcasing “outstanding experimental animation of all sorts” it has featured a wide variety of work from new films to rarely screened masterpieces. The festival is entirely curated, and does not have an open call for entries. Alexander and Lilli told me more about Eyeworks via email. 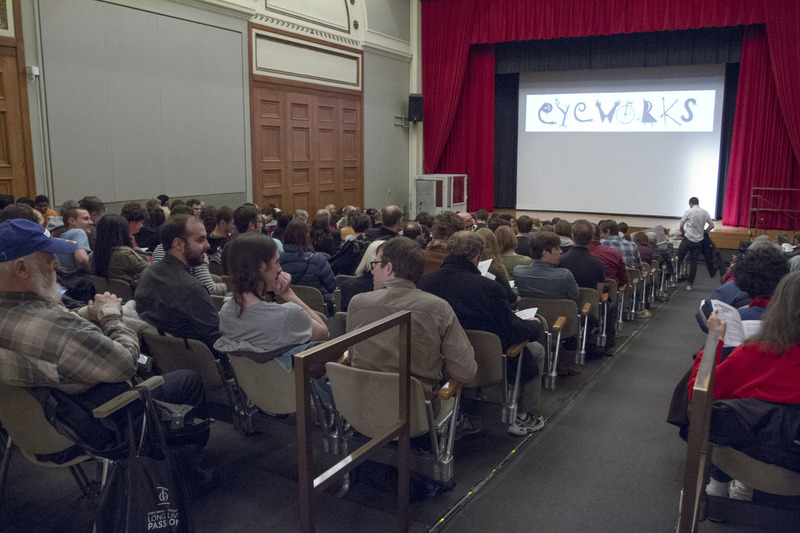 EYEWORKS: When we started the festival in 2010, we were both interested in charting a course that we felt demonstrated what we love about experimental animation. We wanted to do something that created a trail of a certain kind of work that reflects what “experimental animation” is all about for us. Having had a film of my own in the festival, it meant a great deal to be part of something which presents this often-marginalised area of practice in a way that I feel it deserves yet often fails to receive. The festival positions experimental animation as something that thinking, culturally aware adults might find interesting, without reducing it down to a load of ‘weird’ and ‘trippy’ visuals. In showing a well-researched mixture of new and older work it reveals a lineage of animation that many people will not know, contextualising and strengthening an understanding of each individual work in the process. EYEWORKS: Intermingling classic and contemporary work in our programs has been a big part of Eyeworks. There is so much great older work that people haven’t seen because it’s not well known or is hard to access, and it often helps to put the contemporary work in context. Not just in terms of seeing influence, but more broadly, that certain ideas have been things that animators have been interested in for a long time, independently of one another. It was Lilli and Alexander’s own experience of being exposed to some of this rarely seen older work that inspired them to start Eyeworks. EYEWORKS: There were two big inspirations for the festival at the start. One was a daily screening of films we saw while we were visiting artists at CSSSA (California State Summer School for the Arts) at CalArts in 2010. A really great group of animators were teaching there, including Lori Damiano and Leif Goldberg, and every day after lunch a different teacher would pull an hour or so of experimental animations from the incredible film library at CalArts. Getting to sit in the theater every day and have such a wide range of new and classic and obscure films wash over us from every conceivable part of the spectrum of what could be considered animation was so inspiring and invigorating. We wanted to do something that would give other animators that same feeling. The second was the library of experimental animation at Chicago Filmmakers. A friend told us about their large collection of 16mm prints, and we went up there one day to have a look. Their experimental animation prints were originally part of a catalog distributed by a company called Picture Start in Champain, Illinois in the 80’s. Picture Start was run by Ron Epple, who I think taught at the University there, and he had an interest in experimental animations. He distributed a ton of excellent work, including bigger names like Sally Cruikshank, Larry Cuba, Robert Breer, Suzan Pitt, and Henry Selick, among others. When Picture Start closed in the 90’s, Filmmakers acquired their catalog. It’s a unique collection with some rare animations. We’ve been back several times to research animations there, and the first year of the festival, especially, was inspired by the Filmmakers catalog. What was especially interesting for us about the Filmmakers films was that they represented an era of experimental animation that was mostly unknown territory to us at that time, the late 70’s through the early 90’s. Some of these films were by filmmakers who made one or two films as students or as independent animators, and then stopped making work. We were familiar with the big names of experimental animation, like Fischinger, Len Lye, the Hubleys, the Whitneys, etc, but this later era was mostly uncharted for us. We realized how much interesting animation work exists out there that wasn’t very well recognized. It felt like it would be a great project to be able to share these films and others we were excited about with our friends and other animators, in programs like we saw at CSSSA. The idea for a festival just grew naturally from there! Each aspect of the festival is of a notably high standard, something due in part to the decision to keep it small, entirely curated and with a consistent personal vision running throughout. Each film has to meet a ‘double-yes’ criteria, where both directors have to really want to show it. EYEWORKS: A big part of our identity from the start was that we wanted to be entirely curated. It seemed like the simplest way for us to show what we wanted to show. Some of the work that excites us most at larger festivals is often in curated programs like juror’s programs or showcases from a certain place or time period, where one person with specific knowledge or taste is able to bring their identity to the theater and show what they are interested in. The 25FPS festival in Zagreb Croatia was also a big early inspiration. A group of young women in Zagreb started this experimental festival that felt fresh and bold but also very professional and considered, and it really resonated with us. In addition to the personal nature of the festival, the films that Alexander and Lilli select are all personal visions themselves. This spirit connects a wide range of works that vary greatly in technique and approach. EYEWORKS: We’re very interested in films made by one person, or films that show a distinctive individual creative vision. Studio animation is a team project. Those films are fine, but we’re not really interested in that type of work for the festival. We want to see films that feel like a person’s work. The distinction gets a little blurry with films made by a few people or by small teams, but it’s usually obvious to us if the film feels right. Our points of reference are avant-garde films and alternative comics. If an animation feels like it shares the spirit of one of those types of work, then it could be a fit for Eyeworks. Talking about experimental animation in terms of alternative comics makes a lot of sense to me. Aside from the many parallels both mediums have formally, and the way both seem to lend themselves to highly personal visions, they are both areas which exist slightly to the side of mainstream culture, yet feed into it (or are fed off by it). Eyeworks’ personal approach to experimental, often challenging work is a refreshing contrast not only to other animation festivals but also to the academic, theoretical treatment much experimental film receives. I am certainly not against an academic approach but I am not sure it is always the most productive or relevant. This work is living and breathing art, dynamic and challenging. Many of the issues that dominate animation studies, such as a perpetual need to define and label things, seem to me to somewhat miss the point. EYEWORKS: I’d say we are hesitant to attempt to define experimental animation. We’re more interested in exposing audiences to the fact that this category of work exists, and has its own rich history, and is currently a vibrant field with lots of exciting artists making work. The films we show at Eyeworks are all pieces we’re really excited about. Our taste changes, and we recognize that what we would have programmed the first year might not be the same as what we are interested in right now. But, our goal is to have every single film that goes up on the screen during an Eyeworks festival be something we are extremely excited about ourselves at that moment. A phrase we borrow from a friend who’s a pretty dedicated record collector is “straight heat.” That’s his fantasy of getting his collection of like 10,000 records whittled down to one perfect crate of straight heat. Keep the very best 100 records from his collection, the stuff he loves the most, and get rid of the rest. At first we joked about it, but then increasingly the idea of straight heat shaped what were were doing with Eyeworks. We didn’t want to do four days or a week of screenings with tons of animations, just one or two days of supertight programming. We also liked the idea that someone could easily come and see all of the films we show at the festival, which is not very easy with bigger festivals. One crate, straight heat. Straight heat is something you can never actually achieve in real life, but it’s a great thing to aim for. Poster Trailer for Eyeworks Festival of Experimental Animation 2012. Posters designed and printed by Sonnenzimmer. Something that really stood out for me when I first came across Eyeworks was the quality of their design. As artists themselves they are well placed to both produce their own design work, and also to call upon peers such as Ivan Brunetti, Tommi Musturi and Sonnenzimmer to provide publicity materials. 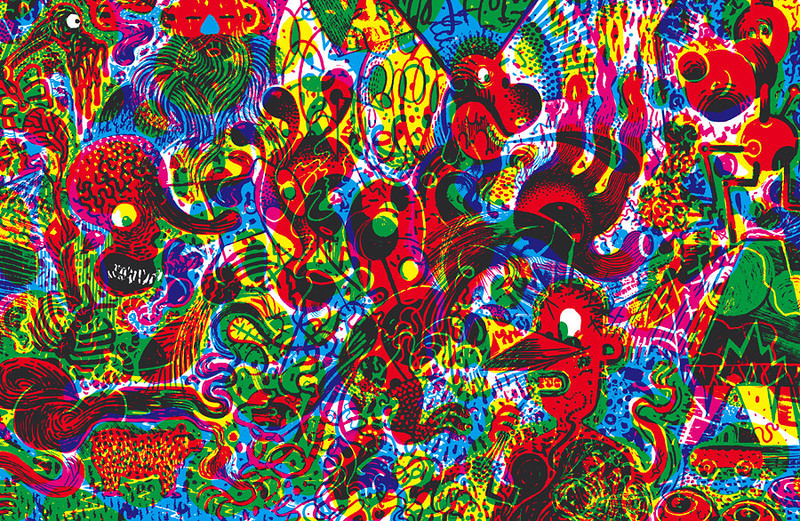 Each of the screenprinted posters for the 2012 festival that Sonnenzimmer produced was different, acting as one frame of a short sequence of animation. This encapsulates what is unique about Eyeworks, it is as much a labour of love and artistic vision as making an animation is itself. Critical to this is keeping the thing small so they can have real control over the detail and maintain a high level of quality throughout. EYEWORKS: It’s just the two of us who work on the festival. We have extremely generous friends who are always willing to pitch in to help us put the festival on, and last year we had an official assistant to help us out. We hire a projectionist every year to handle prepping the media and the film projection. But the curatorial work, the planning, the logistics, the scheduling, the media traffic, those sorts of things, we do all of that. We fund the festival strictly through ticket sales. We had a grant one year, which was really nice, but we pay for it ourselves upfront and aim to make our money back through ticket sales. The attendance has fluctuated, with some shows being as high as 250, and some as low as 40. We’re trying to avoid the temptation of expanding Eyeworks too much. Our main goal is to keep the quality of programming consistently high and consistently interesting. We’re trying to stay at a size that two people can manage and have fun with. At a time when so much work is available to see online it is tempting to question the relevance of the festival context. Whilst viewing conditions are one obvious factor, a festival like Eyeworks offers something more than just a projector and an auditorium. It provides a frame of reference, an insight into an area of practice that many would be unfamiliar with. EYEWORKS: We really do get the sense that experimental animation has a great potential audience waiting to discover it. Animators like it, of course, but we’ve been getting great interest from comics artists, graphic designers, musicians, studio artists, as well as curious general audiences. Showing work in a theatrical context is important to us. The experience of going into a controlled dark room and subjecting your mind and eyes to 70 minutes of animation is something we really put a lot of time into planning for people. We usually try and avoid situations where we are showing work on a loop in a gallery or space where people are walking in and out. Experimental animation is a pretty visually strenuous type of film to watch, and minimizing distractions by having a dedicated theater space is helpful. The first year of the festival we programmed 90-minute shows, and seeing people outside of the theater between screenings, they all looked a bit dazed. 70 minutes or a little under is about right for us, in terms of attention span and endurance. There is more interesting experimental animation being made and being seen today than ever before, and that’s definitely due to the internet. There are just tons more people doing it. The proportion of good to bad work is probably the same as it ever was, but there is probably an exponentially larger number of experimental animations being made today than there were 20 years ago, because of increased access to animation tools on the computer. We love the internet as a way to see animation. We wouldn’t know about most of the work we show if we didn’t have the internet as a resource. Putting work online for people to see and enjoy is great. On the other hand, there are lots of films we’ve shown though that are only available on 16mm. That’s a special treat to be able to show an audience. There’s really no comparison to seeing a nice 16mm print of a film, that’s obviously the ideal viewing situation. by Tommi Musturi, screenprinted at Spudnik Press. For me Eyeworks represents a way of presenting and contextualising experimental animation that is accessible, intelligent and exciting. This work gains so much from having its own curated space, revealing its rich and varied history and highlighting connections between works. There are other great festivals around but hardly any specifically devoted to experimental animation. Hopefully Eyeworks can pave the way, both in their focus on this underexposed area of practice and in their refusal to compromise on their own personal vision.